Original tutorial and images by WunSick with additions by forahobby. 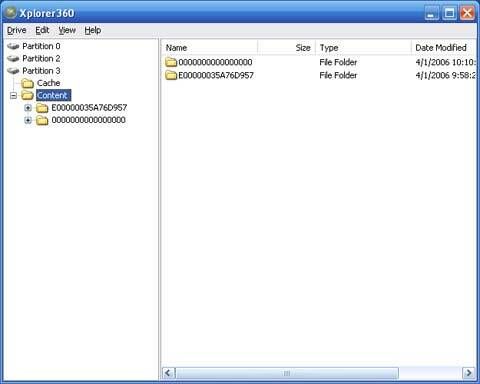 This tutorial will explain in detail how to gain access to your xbox 360 harddrive and transfer files or make a backup of things using some pc tools like x360tool.. So, let's say your overwriting some files and you loose alot of your gamerpics, and demos and such, in fact you ruined your drive and your having reading problems specially with say... Oblivion... Happened to me! Hell, maybe you just want to keep your drive nice and tidy... well ill show you the steps necessary..
1. 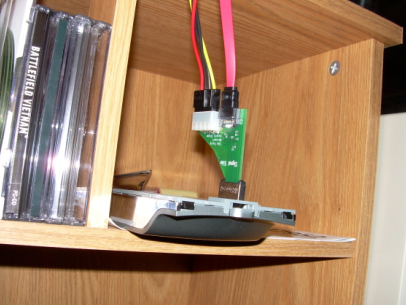 Connect the Xbox 360 Hard Drive to your PC..
Now if your reading this, im sure you already know how to hook the drive up to your PC, so lets skip the pleasantry and dig right in shall we? 1. 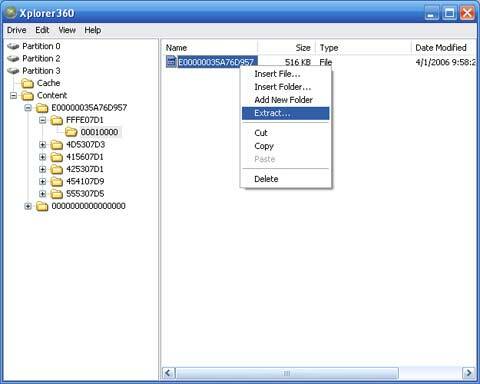 Start the Xplorer360 software on your pc. 3. 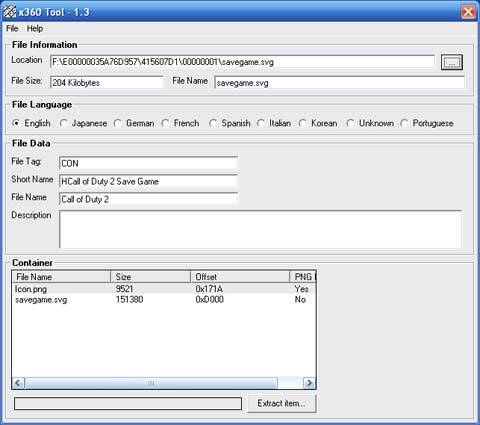 Look for a folder that starts with E000000 and followed by what appears to be random numbers and letters, this is a Gamertag folder. 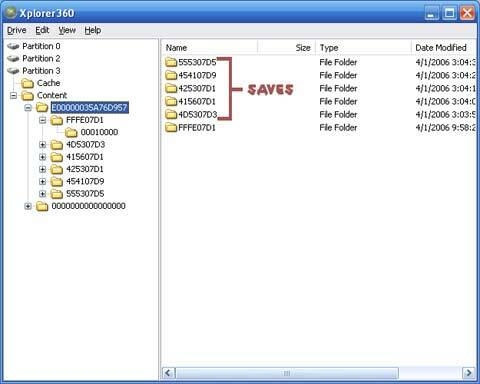 This Xbox 360 Gamertag folder on your xbox 360 hard drive contains save games, and your main account information for that gamertag. Your folder name will differ from mine , so just look inside it and you should find a folder called FFFE07D1 which is the folder that contains all your account information inside the 0010000 folder ( 0030000 explained below). 4. 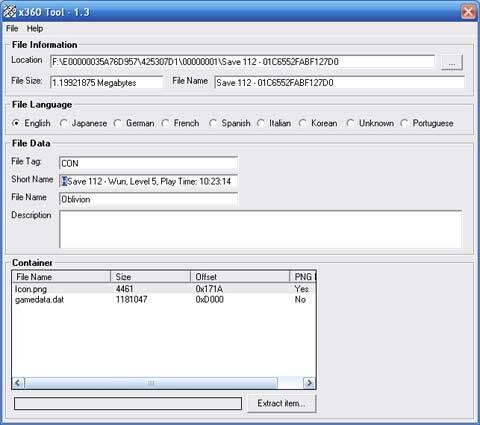 Right Click the file as shown and choose Extract like the example screenshot below. 5. When you overwrite this file, when say, copying a buddies content, this is when game booting, and gamerpics, and settings start to wig out. So be careful!! My oblivion disc wouldnt boot unless i had the HDD off, i fixed this, and we are all clear sailing. 6. Alright, now aside from the FFE07D1 folder, there should be a number of other folders, one for each game u own. These folders are for the save games that are stored for that specific Gamertag. Check the image below, if i were you, id back those babies up! Personally i just extracted the whole E000000####### folder, but for tutorials sake, best you do it in parts so you learn what each folder is. Mine are listed below. 8. As you can see it opens pretty much everything up ok.. Alright, now inside the E000000####### and inside the FFE07D1 folder, you will see 0030000... 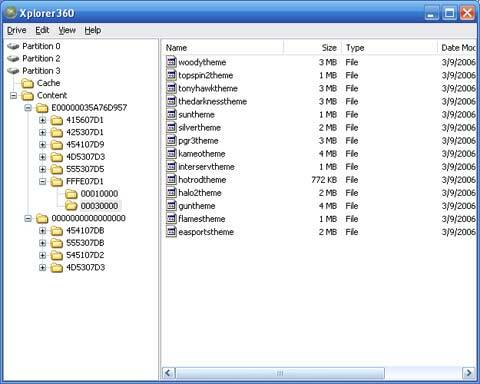 This folder holds SOME of your themes, most of the downloaded themes are in their own folders scattered in the Content�00000000000000 folders so use x360tool to poke around. 3. Scroll down to Memory and select your drive. 4. Go ahead and format it. 5. Once its done, you will need to follow some steps as it will ask you to lock the drive to your specific serial number for your xbox 360. Follow the steps above putting your information back and your all set. I saved all my themes, and saves, that is all that is really needed. If you wish to save some downloaded gamerpictures, you will have to hunt for them as they are not all stored in the same place, if you extract the majority of your xbox hard drive, and search through your files with x360tool, you can find them and pop them back on your drive in the right locations. Load up your xbox 360 and have fun!